The newest member of the ‘long-distance cruiser’ family, the Swift Trawler 30 is an excellent balance of comfort and seaworthiness. She has a range of around 250 miles at 19.5mph cruising speed. The Swift Trawler 30 will take you places quickly and safely. 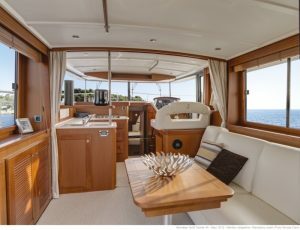 The Swift Trawler 30’s open layout is wonderful for any voyage. Incredibly ingenious, the rear cockpit converts into a spacious terrace over the sea, while the flybridge, with a small lounge and steering station, creates a completely separate living space. 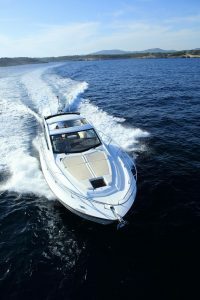 Following the “day boat” concept, The Gran Turismo 35’s design increases fun and relaxation on the water; from the open, spacious cockpit to the large swim platform and comfortable sunbathing pad on the forward deck. These improvements enhance the enjoyment of outside areas while the renowned Beneteau finishing touches create comfort inside. 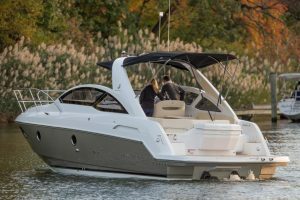 Beneteau’s patented AirStep® hull design with twin sterndrive engines gives the Gran Turismo 35 a more comfortable and stable ride, better safety, and superior performance. Derived from aeronautical technology, the Air Step® forms small steps under the hull that evacuates the water stream and reduce friction. Combined with captured air forming a cushion, as well as runners to the rear of the hull increasing stability, these steps considerably increase speed, while reducing energy consumption. 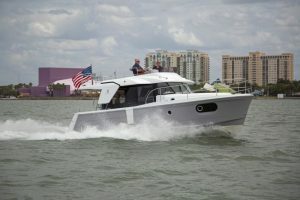 The Swift Trawler 34 is built on a semi-displacement hull designed to cut through the waves with minimal resistance. 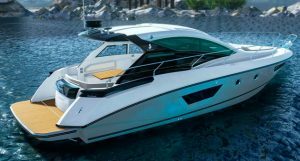 The first-rate hull makes her the most economical boat in her category: from 12 to 19 knots she demonstrates exceptionally high performance at a rate of 1 nautical mile per 0.1 gallons. Her wide range of speed, skillful construction, and impressive turning radius always provide the utmost of comfort while underway. With two double cabins, a lounge that converts into an extra cabin and a functional U-shaped galley, the interior is full of space. 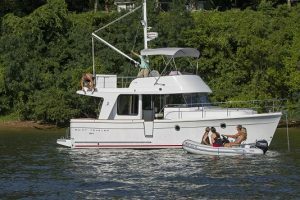 Thanks to her fuel efficiency, long range cruising capacity and stability, the 40 MY is a truly multipurpose boat, whether for a sunny day at anchor, coastal discoveries or a long distance cruise. Inside, her Nauta designed accommodations combine elegance and comfort, with an option of 3 or 4 cabins. On deck, the 40 MY offers all the advantages that will guarantee real cruising pleasure: large sheltered cockpit, rigid bimini, convenient steering station, sunbathing area on the cabin top. The slender lines of the Gran Turismo 40, underlined by her hardtop and exquisite side glazing, emphasizes her pronounced sporty character. Built with a centered helm and the latest generation Air Step® hull, she is not only superior at the wheel but safe, even when traveling at speeds up to 38 knots. The spacious cockpit can seat up to 11 people with the outdoor deck galley and electric grill off the back. The layout of the lower deck gives you a feeling of space unrivaled on a boat this size. Facing the spacious salon is a proper fully-fitted galley complements the deck galley. The Gran Turismo is constructed with two cabins, a head, and separate shower. Matte finished walnut woodwork, and richly upholstered furniture is the signature mark of her elegance. 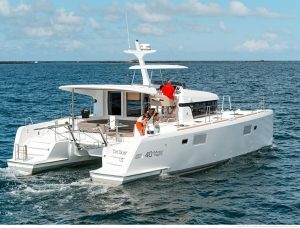 Underway, the Swift Trawler 44’s semi-displacement hull offers very enjoyable sensations at all speeds, as well as terrific stability as she breaks through the waves. The Swift Trawler 44 adapts to all sea conditions and can reach a top speed of 24 knots. Its starboard walkway and flybridge ladder are well protected. She is timelessly elegant, combining classic style and great modernity. Large hull portholes bathe the cabins in sunlight. The convertible sofa with a separating curtain turns the saloon into private space; creating a third cabin in just a few seconds. With the owner’s suite offering a full beam view of the water on both sides and a guest cabin with a head and separate shower, the Gran Turismo 46, in a two or three cabin layout, offers superior accommodation for her size. Her interior is well-ventilated and provides a lot of natural light. Gorgeous woodwork enhanced by rich materials such as titanium, leather, and lacquer finishes all work to create a comfortable and luxurious environment. The Gran Turismo 46 has an open hardtop, electrically operated side glazing, and a wide glass door that protects the cockpit. The large swim platform is submersible and can easily take the weight of a Jet Ski or dinghy. There is even a storage locker in which all your swimming and water sports accessories can be kept close at hand.